PEACHVELVET: TYIN tegnestue Architects "Soe Ker Tie House"
TYIN tegnestue Architects "Soe Ker Tie House"
In the fall of 2008 TYIN travelled to Noh Bo, a small village on the Thai-Burmese border to design and build houses for Karen refugee children. The 60 year long conflict in Burma forced several hundred thousand people to flee from their homes. The conflict leaves many children orphaned, with little hope for the future. Ole Jorgen Edna from Levanger Norway had opened an orphanage in Noh Bo in 2006 and was now in need of more dormitories. The orphanage sheltered 24 children, however the intention was to house around 50. The main driving force behind the Soe Ker Tie House was to provide the children with their own private space, a place that they could call home and a space for interaction and play. The Soe Ker Tie House is a blend between local skills and TYIN's architectural knowledge. Because of their appearance the buildings were named Soe Ker Tie Haus by the Karen workers; The Butterfly Houses. The most prominent feature is the bamboo weaving technique, which was used on the side and back facades of the houses. The same technique can be found within the construction of the local houses and crafts. All of the bamboo was harvested within a few kilometres of the site. 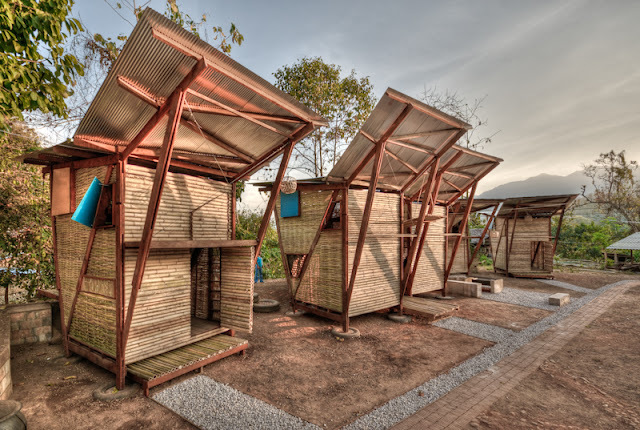 The specially shaped roof of the Soe Ker Tie Houses promotes natural ventilation within the sleeping units and at the same time rainwater can be collected and stored for the dry season. The iron wood construction is assembled on-site using bolts ensuring precision and strength. To prevent problems with moisture and rot, the sleeping units are raised off the ground on four concrete foundations, casted in old tires. After a six month long mutual learning process with the locals in Noh Bo, the Soe Ker Tie House was completed in 2009 consisting of 6 sleeping units, housing 24 children. Important principles like bracing, material economisation and moisture prevention, may possibly lead to a more sustainable building tradition for the Karen people in the future.